GATE 2018 ECE, EEE Answer Key Download for 10th February Morning & Afternoon Sessions with solutions by Coaching institutes like Made easy, Ace, Time, Gateforum, The Gate academy etc. 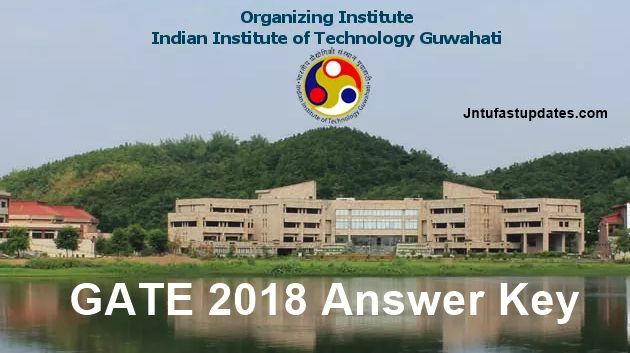 The Indian Institute of Technology Guwahati (IITG) has released GATE ECE Answer Key 2018 and GATE EEE Answer key 2018 with Question Papers at gate.iitg.ac.in. Here, we will provide you the GATE Electronics and Communication Engineering (EC) and Electrical Engineering (EE) Preliminary and official Answer key’s which is Conducted on February 10, 2018. Graduate Aptitude Test in Engineering Answer Key 2018 is released along with Question Paper. GATE 2018 Answer Key is made available by IITG for candidates who appeared in the GATE 2018 Examination in the month of February. The answer keys of GATE 2018 can be checked to analyse exam performance, and one can also challenge the official keys within the given time­ frame before the declaration of results. Here you can Get GATE 2018 ECE, EEE Answer Keys for 10th February Forenoon and afternoon sessions. After the GATE 2018 examinations, candidates’ responses will be available at GOAPS. Answer keys for various GATE 2018 papers will be displayed in GATE 2018 website. Candidates may submit their contests on the answer keys provided for a very limited time period against a payment. Evaluation of examination papers will be finalized and GATE results (Score) will be announced. GATE 2018 scorecard will be made available for the qualified candidates from GOAPS. GATE Exam Answer Key 2018: GATE 2018 online exam was conducted on February 3 – 4, 2018 & February 10 – 11, 2018 in Morning and Afternoon Sessions. After Complete the Exam, some of Coaching institutes has released the SET wise unofficial answer keys for Electronics and Communication Engineering (EC) Morning Session and Electrical Engineering (EE) afternoon session. Candidates those who have written the Exams on 10th February Eagerly Waiting For the Answer Key of GATE 2018 MadeEasy, TIME Institute, Carrer Power, Carrer Launcher, Ace Academy, GateForum Coaching Institutions. Candidates who want to Download Gate Exam Answer Key official and unofficial from Below. GATE Answer Keys for 2018 will be published at official site. As per the official GATE 2018 answer key, marks will be evaluated for each candidate. The candidates who score marks more than the qualifying cut off will be declared as qualified in the GATE Result. Gate 2018 Electronics, Electrical final answer key is obtainable at official website of GATE i.e., gate.iitg.ac.in and we are also provide the direct links for your branch questions along with answers. The GATE Answer Key 2018 is released for each test series (A, B, C, D). The paper consists of Multiple Choice Questions (MCQs). For each question, there are four options. Candidate has to select one option among them. Negative marking is applicable for each question in which a wrong answer has been marked. One-third (0.33) of the marks assigned to that question will be deducted as penalty. GATE ECE, EEE Answer Key 2018 will be available along with the question papers after a few days of examination. The answer key will provide separately according to the paper code. Students have to know their session number & GATE paper subject code to check the answer key. The organisation releases the ECE, EEE Answer key in set wise like SET A, SET B ,SET C and SET D on the official web portal. After completion of exam the official question papers and final answer keys of GATE 2018 Examination are available. For multi-session papers, the result view displays the normalized marks which may be different from the actual marks obtained. IITG has declared the GATE 2018 Answer Keys session wise. Candidates can raise any objections or comments to the GATE 2018 Answer Key by March 5, 2018. The decision of the GATE committee is final in this matter. Candidates can also check un­official GATE 2018 Answer Keys released by coaching centers and individuals which are also made available here. Coaching institutes such as Made Easy, Ace Academy, TIME published answer keys of GATE 2018 for all the papers a few hours after the exam. Candidates can download the GATE 2018 ECE, EEE Answer Key with Question Papers below, by clicking on the given links. How to Download GATE Answer key 2018 ECE, EEE? Go to official website: gate.iitg.ac.in or Gate2018results.com. Click on the link Gate answer key PDF with OMR Sheet. Keep the printout of the answer key for future use. 1.4 How to Download GATE Answer key 2018 ECE, EEE?